For awhile I was stuck on this one. It took a little time to realize that the beginning was the name of the fictitious band, not the photo. When I had worked out Dead Poets' Children as a name with possibilities, I agonized over whether or not to use an apostrophe, and if so where to place it. Poets', or Poet's, or Poets? All had dark and twisted logic behind the choice. I next Googled 'Death" and 'Song Titles' and came up with quite a number. So I began thinking of an album title. Something to do with classics, or oldies and came up with "Dieing to Sing the Classics." I was thinking of putting the names of the cuts on the cover but I didn't know if they were classics or new or what. In the end, there wasn't room on the cover. I guess that's why record companies put the names of the songs on the back. And in the end, "Classics" morphed to "Blues." Dieing to Sing the Blues. That seemed to work. Finally I had to choose the font for the text and the placement. This took longer than shooting and post processing the image combined. I ended up with Kendo ITC as the font for the band name because it seemed to fit the name of the band, and didn't cover up too much of the photo. I used Charlemagne for the Album title because it was less jaggy and more readable. Going to save for the web I ran into another difficulty. 640x640 was 600K. Jpeg quality get pretty low around 150K. So, choose a smaller image, say, 500x500 at 71% or stay at 640x640 at 40%? I made a choice. You'll be the judge. 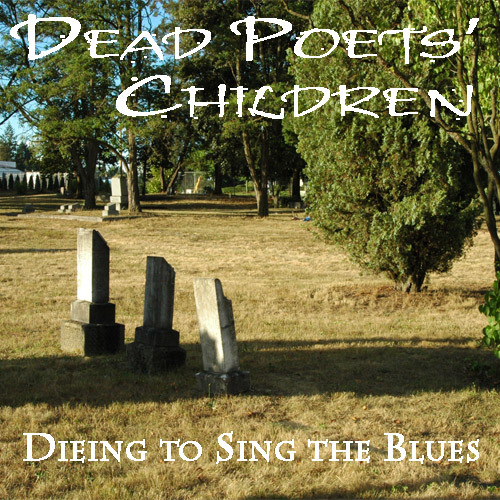 And voila: DPC's (Dead Poets' Children) debut album, Dieing to Sing the Blues! Good attempt on the challenge. Excellent name you came up with shows a lot of creativity. The one thing I see here that I would say hurt you was that shadow over those 3 stones. They seem to be your main point of interest and yet the shadow just distracts from them. The other thing that might have helped here is making it duotone. It would have gave it a more eerie feeling. This met the challenge well. Your text is really pixelated, and highly distracting, but I like the photo, and the name. I like the title and the white lettering. Image gives somewhat of eerie feeling with the harsh lighting. The three tombstones also seem to contribute to this and seem to convey some sort of meaning. Ordinarily, I would say that technically the too well defined shadow that goes accross the image and subject (tombstones) would be a detraction, but in this case, I think it's appropriate and also adds to the general feeling of today's groups. Didn't like this when I first saw it, but after looking at it for a while I think it's a good effort. As a graveyard shot, I think black and white would better suit this. The bright blue skies don't fit the theme. Compositionally, I think this could also be improved, maybe by getting closer in on the graves or using a wider aperture to throw the background out of focus. Dark humour here. Funny. A little creepy...but funny. Should be "Dying". The font is kind of cheesy looking for authenticity. The photo works okay as album art but I don't find it to be a great photo. I'd like the focus of the photo to be the graves -- seeing the trees as the sharpest object is a bit distracting. As for your graphical editing, you should turn on anti-aliasing on your text, as it'll help make everything fit together better. Proudly hosted by Sargasso Networks. Current Server Time: 04/19/2019 02:18:36 AM EDT.